An infrared emitter hidden inside its lens can relay commands to your TV and other devices in its field of view. Because while the Remocam home security camera ($199) boasts most of the features we’ve come to expect from these devices, Remocam has ambitions for it beyond simple surveillance. The company views it as a gateway device for home automation. Outfitted with a an infrared transmitter, the Remocam can be programmed to control any home device that uses an IR remote—TVs, smart bulbs, air conditioners, you name it. The implications are pretty cool. Now, not only can you use your camera to check in on Fido, you can remotely activate his pet feeder to dispense some kibble if he’s acting “hangry.” See movement in your living room? Flip on the TV or home stereo to scare off an intruder (there are also a few smart plugs that can be triggered by infrared signals, so you could also turn a lamp on to get a better look first). This is a clever and useful feature that sets the Remocam apart in a mostly copycat category. 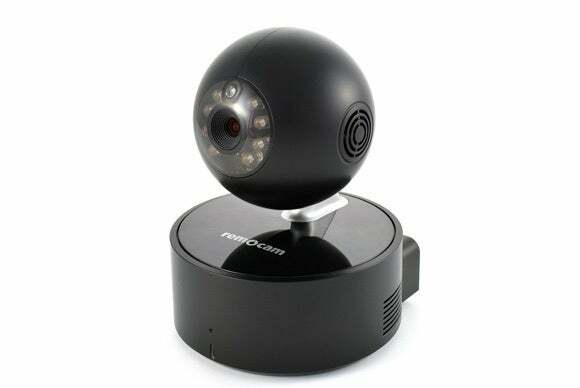 The Remocam is a tennis-ball sized “head” that connects to a cylindrical base via a short stem. The head contains a 720HD camera ringed by eight infrared LEDs that provide night vision. The infrared transmitter that lets you control home-entertainment devices resides beneath the lens. The base houses a speaker and a microphone, so you can communicate with children, pets, or anyone else you may be monitoring at home. 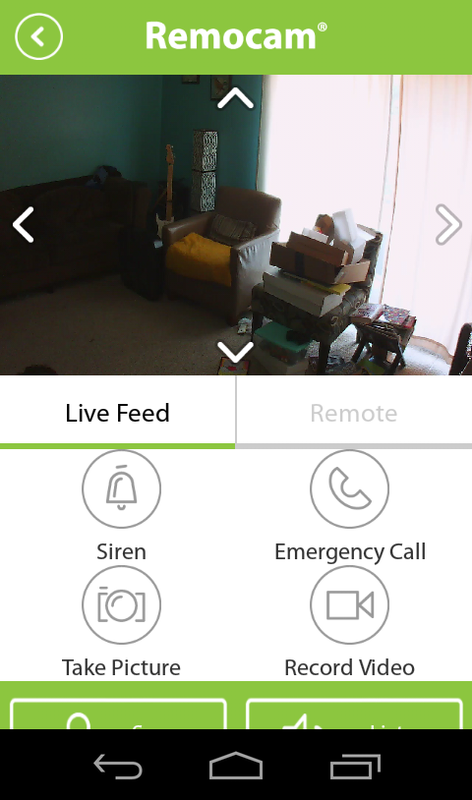 In the event of a break-in, you can also sound an alarm from the Remocam app. The camera has a 70-degree viewing angle; that’s a little narrower than many security cams, which typically boast angles greater than 100 degrees. Any viewing limitations are mitigated, however, by the camera’s pan-and-tilt functionality—335 degrees horizontally, and 95 degrees up and down—which allows you to change the camera’s field of view on the fly or even remotely track an intruder’s movements in your home or business. Remocam also has a 3x digital zoom for honing in on areas of interest. The camera has a built-in mic and speaker for two-way audio communication. It can also emit a siren to scare off intruders. Remocam includes a motion sensor and will push a notification to your phone when it detects movement. 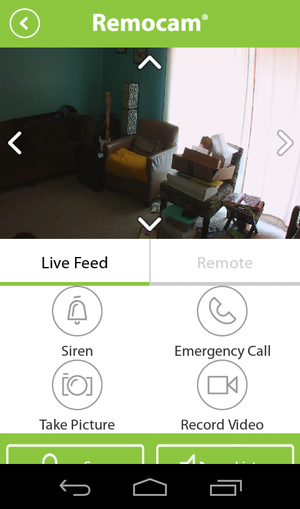 You can customize motion-detection sensitivity through the Remocam app. The camera doesn’t support audio detection, though. While that’s not uncommon, it does mean you can miss out on activity—whether it’s a break-in or a misbehaving pet— that’s happening outside the camera’s field of view. You can store surveillance videos and images locally on up to a 32GB microSD card (not included, as is typical). Alternatively, you can opt for one of Remocam’s cloud subscriptions: The Jog plan gives you 3GB of storage for up to three days for $4 per month or $40 per year. The Sprint plan boosts that to 30GB for up to seven days for $8 per month or $80 per year, and the Marathon plan offers unlimited storage for up to a month for $28 per month or $280 per year. Despite their promised out-of-the box operation, many security cameras are arduous to set up. Remocam is an exception. Once you plug the camera in and hear it say “Welcome to Remocam,” you just open the app and follow the prompts. The process simply involves creating an account and holding an on-screen QR code in front of the camera lens to connect to your Wi-Fi network. The Remocam app is extremely intuitive to use. Remocam is designed to be used with your iOS or Android device, and the Remocam app gives you everything you need to access and control the camera. When you open the app, you’re presented with the camera’s live feed window across the top of the home screen. Beneath it are toggles for turning the motion sensor on and off and activating push notifications and saving videos and images to the SD card or the cloud. Although the last have separate toggles, you cannot save locally and to the cloud at the same time. That’s a bummer, because ideally you’d like to have an offsite backup of all your surveillance footage in case an intruder compromises your camera and its forensic evidence. Tapping the play button on the live feed window activates the camera’s video stream on a new screen. You can pan and tilt Remocam by pressing one of the four directional buttons on the image. Beneath the window are the camera’s controls: from here you can take a still picture or manually start a video recording and trigger the microphone and speaker. If you catch a burglar in the act, you can also activate the camera’s siren (it sounds like a police car en route), or place an emergency call (it defaults to 911, but you can add other numbers in the settings) by pressing the appropriate icon. False alerts are one of the hazards of motion detection. Innocuous movement such as a fluttering curtain or rustling leaves outside a window can trigger the camera. Remocam mitigates this with motion detection areas. Rather than monitoring the entire area in the video frame, you can select areas to focus on. The app gives you two options: you can choose one of six large areas or choose one of 12 smaller areas. These are presented as a grid of checkmarks, each check representing a detection area. You just tap the ones you want Remocam to monitor. The camera’s security features get high marks across the board. Both live and recorded daytime video were extremely sharp with rich color in our tests, and audio was crisp. Night vision was also excellent, and the pan and tilt motion was responsive and smooth. Most importantly, each time motion was detected, I immediately got a notification that I could tap to access the live feed and then a video clip of the triggering event. The camera has a built in mic and speaker for two-way audio communication. It can also emit a siren to scare off intruders. Should you decide you want enlist the Remocam in your smart home system, you’ll need to add the desired appliances using the Remote tab in the Remocam app. If you own a Sony, Samsung, or LG TV, this is fairly easy —there are preprogrammed controls for these brands, so you just tap Add Device, then select the appropriate one. Adding other TVs or devices is more involved. You need to program each function for each device separately by facing the camera at the device, and then pointing the device’s remote control at the camera and pushing the button corresponding to the action you want to record. You can add up to four commands per device. I “programmed” the Remocam to use with my Panasonic HDTV. Adding each control one by one is tedious, especially since the camera rarely captures the action on the first attempt. But it is a pretty cool feature. You essentially end up with a universal remote for all your added appliances, and when you tap one of the controls, the camera will rotate toward the relevant device and execute the command. Even without the IR feature, the Remocam would rank among our favorite home security cameras thanks to its superb performance and intuitive app. Anyone looking to purchase some peace of mind shouldn’t hesitate to consider it. And if you’re also interested in automating your home, Remocam offers an easy and excellent way to get your feet wet without the expense of replacing your current appliances with smart ones. 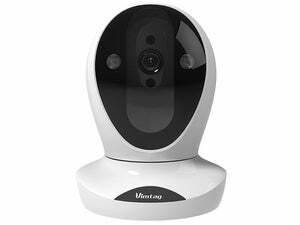 Easy set up and the ability to control other devices in the home makes this a good choice for first-time security camera buyers.